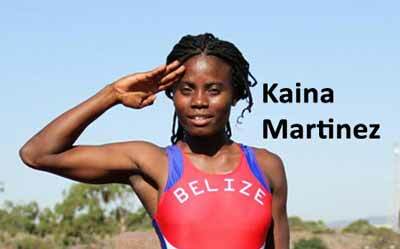 Google “Belize’s fastest sprinter” and the name that will pop up on your screen is none other than the Seine Bight sprinter, Kaina Martinez, the woman who proudly says that she has carried Belize “on her back and on her chest” at several international events, including the 2012 Olympics held in London, UK—yet she has never been given the accolades she deserves. There are still several Belizeans who are enraged by the fact that Kaina was not picked to run for Belize at the 2016 Olympics in Rio, and the only defense Belize’s Olympic Committee could offer was that the well-known athlete did not submit the requisite document by the deadline. Kaina said that that is “a story they created” about her. She believes that she was “dissed” in favor of Katy Sealy, the British woman with a Belizean father who has at times competed for Belize as well; but Sealy is no Martinez and if they were both put up to a challenge at the Marion Jones Sporting Complex, the odds are that Martinez, and indeed a few other Belizean sports starts, would outsprint her. The decision to exclude Kaina from the Rio Olympics was a major blow to her athletic career, which notably peaked in 2014, when she ran in several games for Belize while getting a regional and international reputation in her preferred sport – track and field. For this Garifuna sports star of Seine Bight and Independence in Stann Creek, her desire has always been to make a difference in the sport. What the Rio rejection cannot take away from her is her motivation to make a change. “If it means go to the end of the world to make it happen, I will do it! Every disaster that comes, I find strength in it!” said Kaina, who is also an officer in the Belize Coast Guard, currently on study leave. Kaina has worked hard on self-improvement. She actually started her engagement in sports at St. Alphonsus RC School in Seine Bight, and in high school, she was a recognized MVP in basketball and softball; then she realized that she should focus on track and field; and particularly developing her sprinting skills. Her hard work and dedication has led to her being awarded an athletic scholarship at Texas A&M in Kingsville, where she enrolled in an undergraduate program in Speech Communication. Martinez warns Belizean athletes that natural talent is not enough; she said that she is proven example that that natural talent won’t get a person anywhere without the requisite hard work, investment and support. “Sports is a business; take it or leave it!” she said. “The athletes need to wake up a bit more and see it more than just an everyday game or a fun thing. There is so much in sports and I feel like athletes don’t know what their rights are; they don’t know their power. That trickles down to how our society is running. We settle for a little bit of nothing or nothing at all,” she told us. Kaina describes the lack of proper investment in sports; and also the dearth of respect for Belize’s own homegrown athletes. There are times she feels like there are those who do everything to tear down instead of build up. By contrast, she said, there has been a lot of fanfare over Marion Jones, the former Olympic star who flew the Belize flag in celebration of her Belizean ties; and Simone Biles, who was widely featured around the time of the Rio Games as she boasted about her love for Belize, the hometown of her adoptive mom. And even as Simone was being welcomed for an all-expense paid vacation in Belize with her family, Martinez was still out in the cold; and her return to Belize around the same time—on break from university studies—went largely unnoticed. Kaina said that whereas Belize has celebrated those athletes, “Belize did not make any investment in them at all,” and her suspicion is that those who control things in Belize prefer to keep investment in the sports low for “the opportunity to travel and the opportunity to get a bit of money”—suggesting opportunism rather than altruism for Belizean athletes. “I don’t have time for these people anymore!” Kaina told us. “I feel sports could help change the country, but youths have been totally dismissed in our society; there is nothing to do and they took sports away from them. After high school, sports is nothing in Belize,” said Kaina.